For the past few months, I have been working on my rendering techniques, more specifically in producing authentic watercolor effects using SketchUp as the modeling tool and Fotosketcher as the rendering engine. As a result, I was able to come-up with a new improved watercolor illustration method which requires a few additional watercolor hand drawn textures and photo manipulation technique. 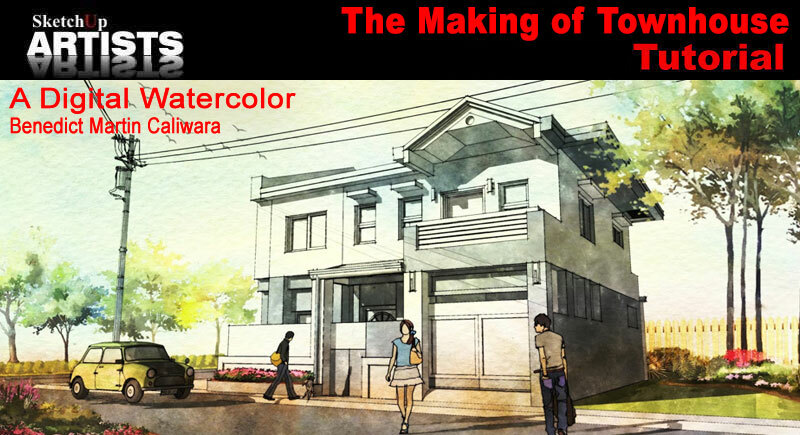 Here, the idea is to play with different watercolor textures (hand drawn images) and blend it in your SketchUp model image with the right amount of tones. 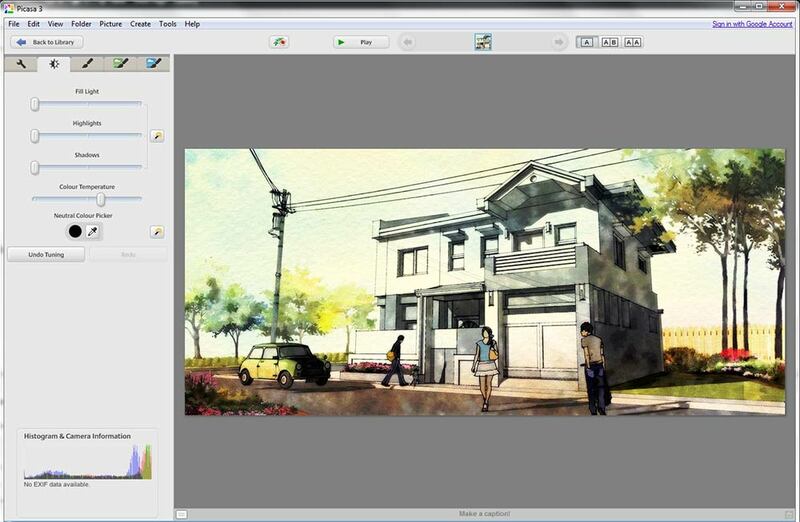 (1) SketchUp, (2) Photoshop, (3) FotoSketcher, and (4) Picasa. 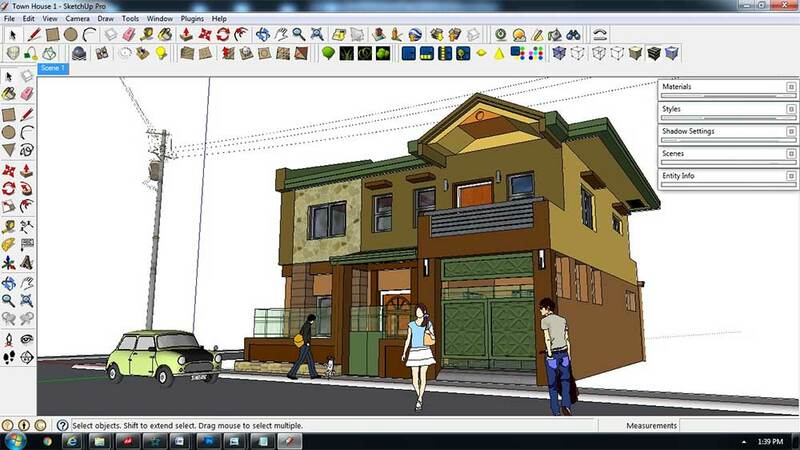 You will need a basic knowledge of SketchUp and some photo editing skills for this tutorial. 1. 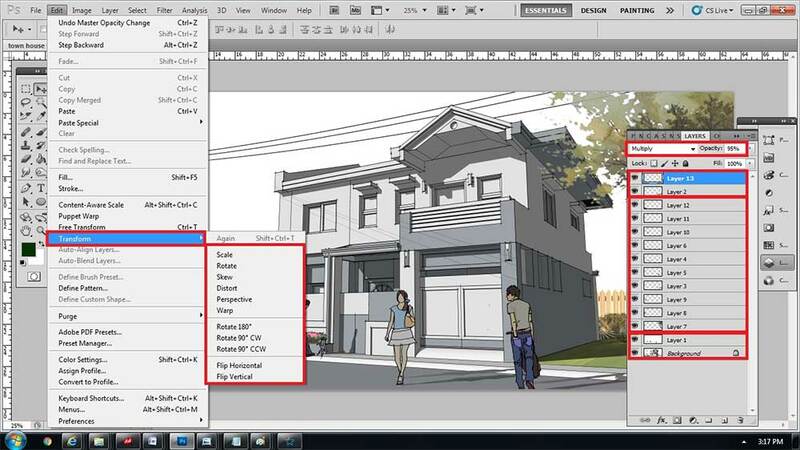 Open your SketchUp file and choose Engineering-Meters template (or any template with no tinted horizon). 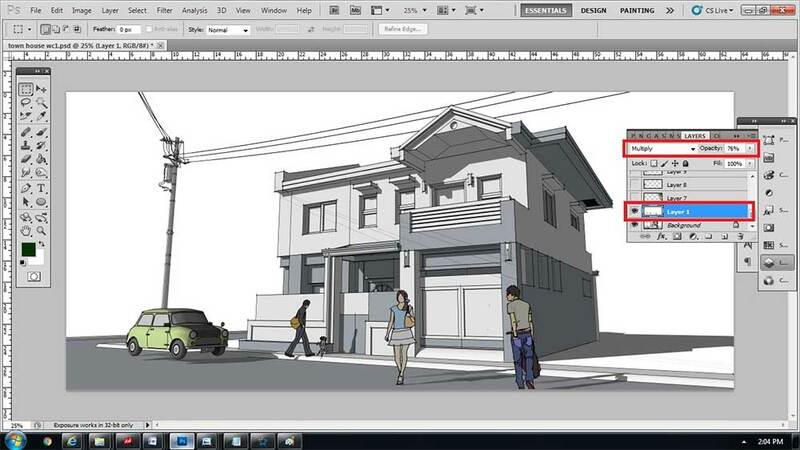 My process began with the SketchUp modeling of a town house, followed by inserting entourage in the scene (2D image people, 3D model car and 3D model electric post). 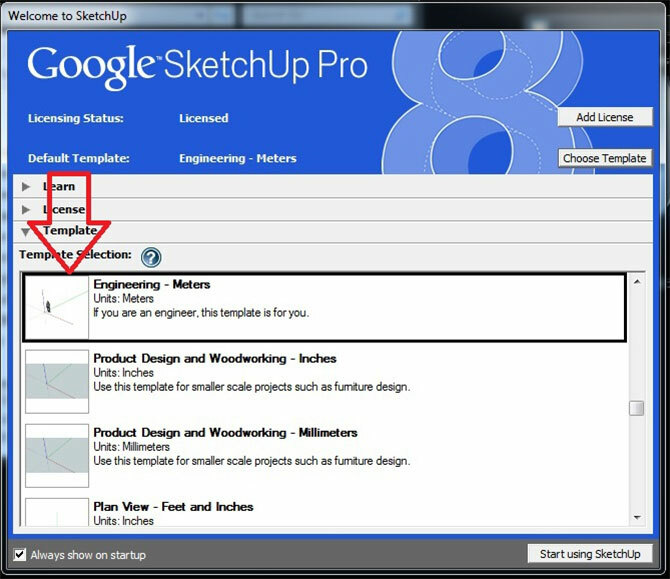 The following entourage can be downloaded from 3D Warehouse (the official repository website of most SketchUp users). 2. 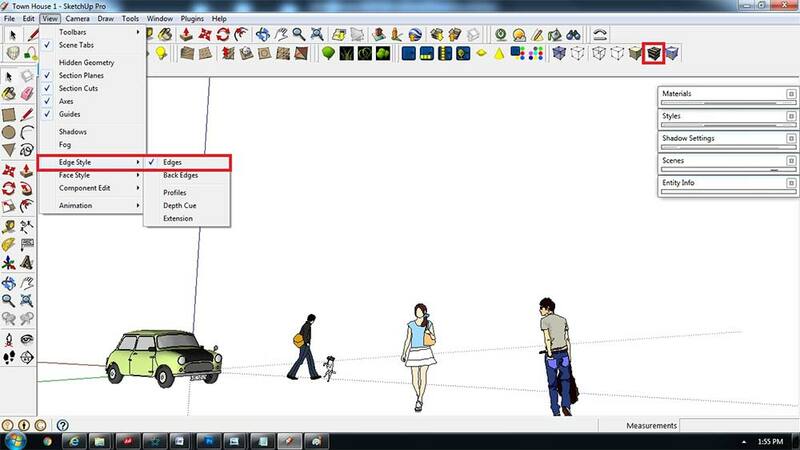 Group your entourage (2D image people and 3D car). 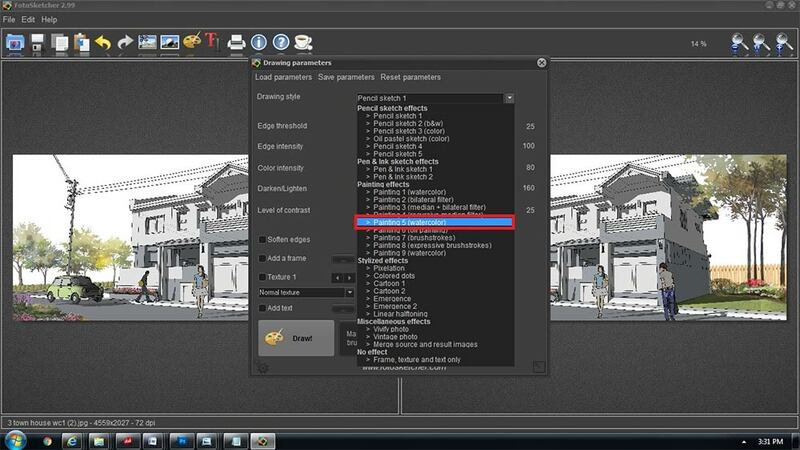 Here, select the entourage models> right click mouse button> select ‘Make Group’. 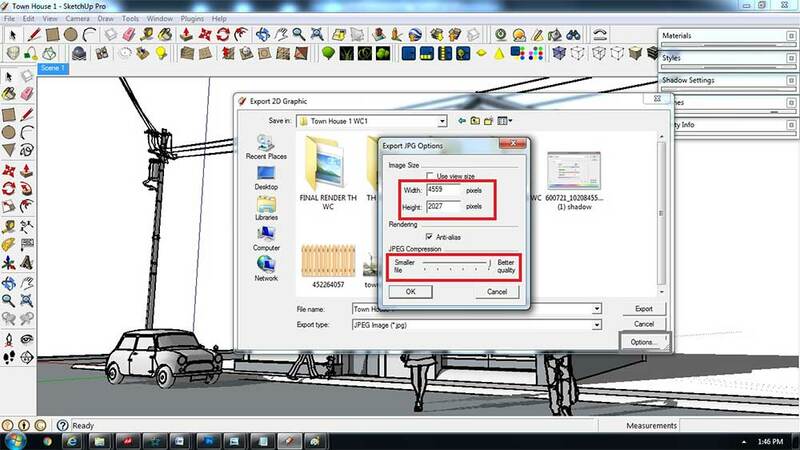 This will enable you to easily hide and unhide the selected group(s) when creating a scene. 3. Find your preferred perspective view. Save your Scene by going to View> Animation> Add Scene. 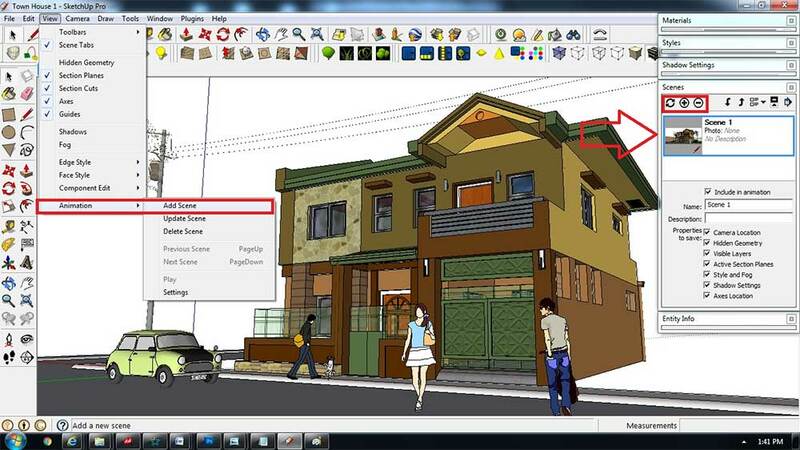 Creating a Scene in SketchUp enables you to capture a state of the model, thus you can go back to the same view and settings when needed. 4. 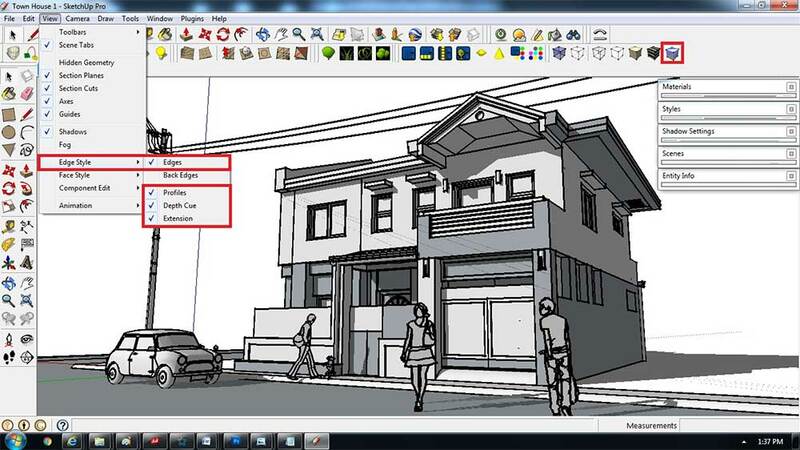 For the main Scene, set your SketchUp model to Monochrome Style with Shadow turned on. Go to View>Edge Style and in the pop out menu select the Edges, Profiles, Depth Cue and Extensions. 5. Export the main scene (all models) in monochrome style. To do that, go to File> Export> 2D Graphic and save in JPEG format. Export the image in a large image size or better quality in order to capture the greatest amount of detail. 6. Export the entourage models only. 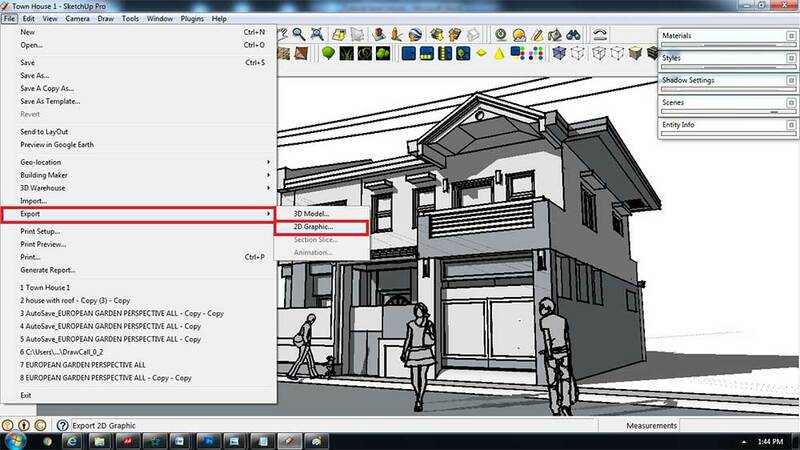 To do that, select all (Ctrl+A)> hold shift and click the entourage group> right click on the town house and electric post model > select Hide. 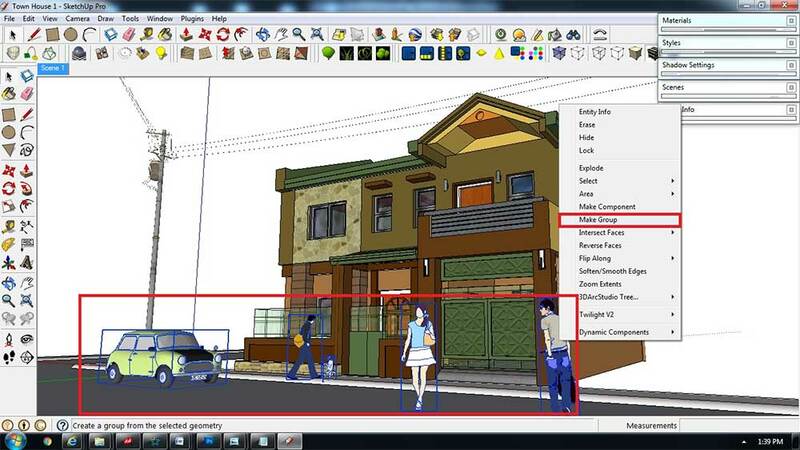 Set-up your entourage models with default styles such as Shaded with Textures and Edges. Disable the Shadows. 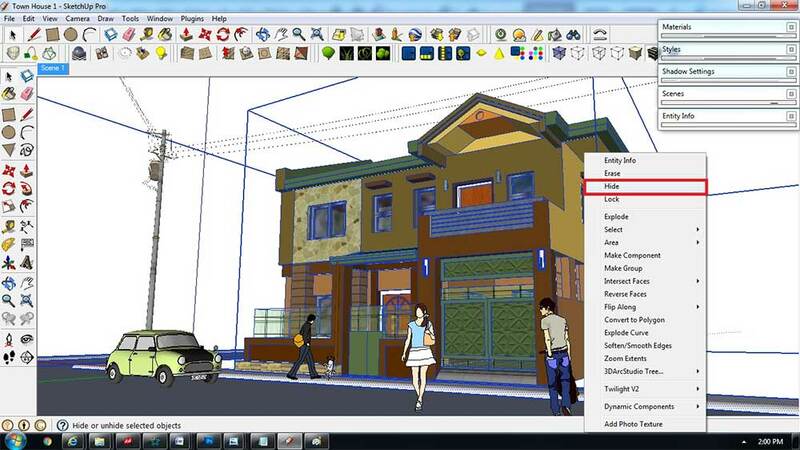 Export the grouped model as a 2D image. NOTE: Notice that we only exported two images (1) Monochrome Style with Shadows and (2) Textured entourage without Shadows. The idea is to play with different watercolor tones in our exported monochrome image and the rest is adding details such as textures, plants, people, birds, and so on. 7. Open all the exported images in Photoshop. The monochrome image will be your Background Layer and the exported textured entourage image will be your first Layer on top of it. For the first Layer (entourage), set the Blend Mode to Multiply with 76% Transparency. 8. 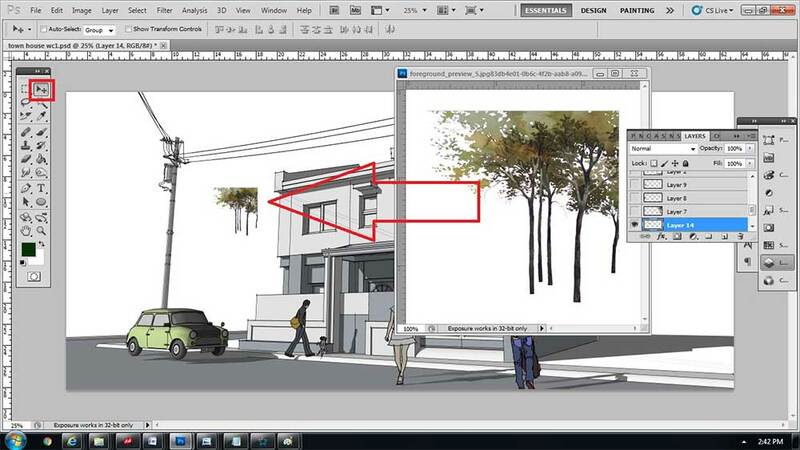 Using Photoshop, fill the background scene with all the watercolor hand drawn images (plant entourage). 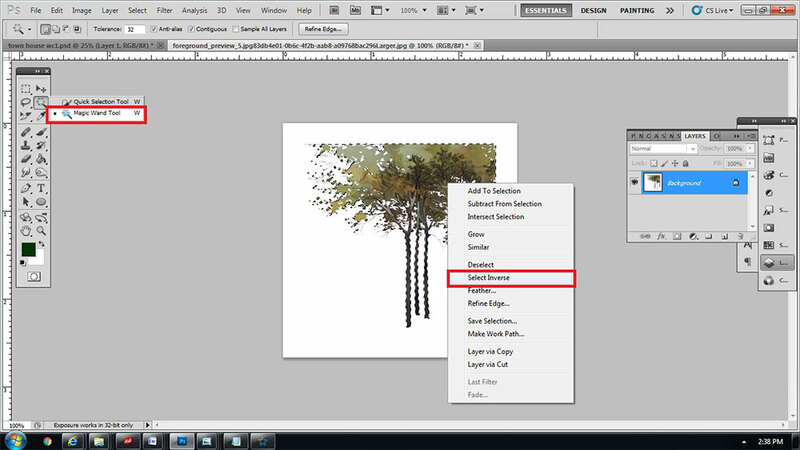 To do that, open the watercolor image in Photoshop> use the Magic Wand tool> right click on the image> click ‘Select Inverse’> drag the image to your scene using ‘Move tool’. 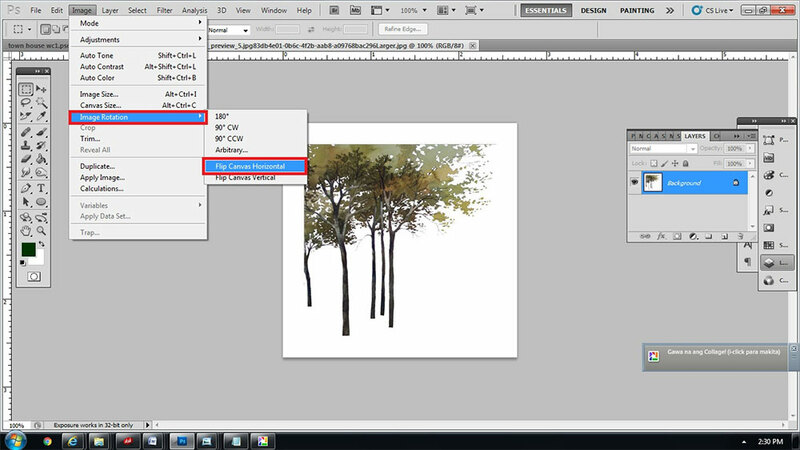 Change the image view if needed (horizontal or vertical) before dragging the image to the other file Layer. 9. 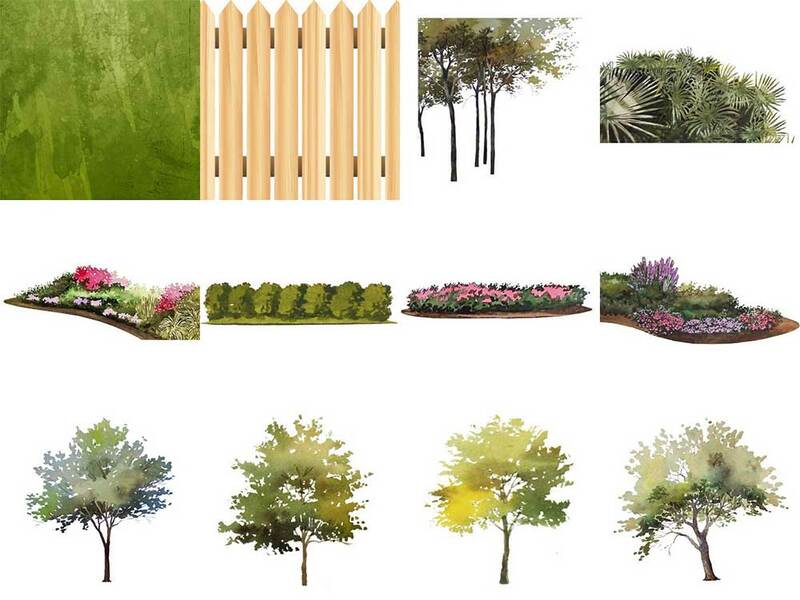 The entire entourage image Layer should be set to Normal Blend Mode while the grass lawn watercolor texture and fence image should be set to Multiply Blend Mode. 10. In order to fit all the entourage images, you can adjust the image size by using transform command. Select the layered image> press Ctrl+T or (go to Edit > Transform, then choose any of the Transform commands in the sub-menu). 11. Adjust the Opacity of each entourage Layer with a value ranging from 65% to 95% Opacity. Reproducing the entourage at full color would not allow for additional color to be added. Therefore, it was necessary to lighten the Opacity of each Layer. The further the entourage from your main object (town house) the lesser the Opacity. 12. 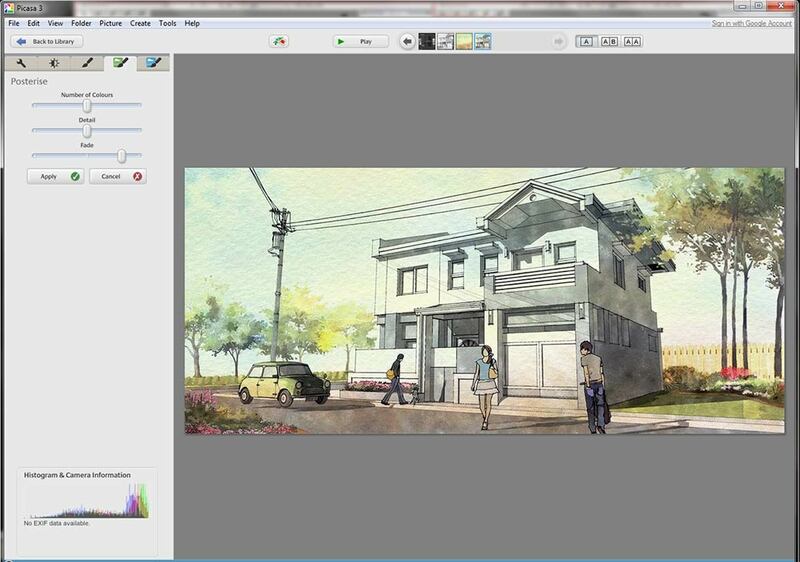 Erase all the excess colors and then Save your work in JPEG format. 13. 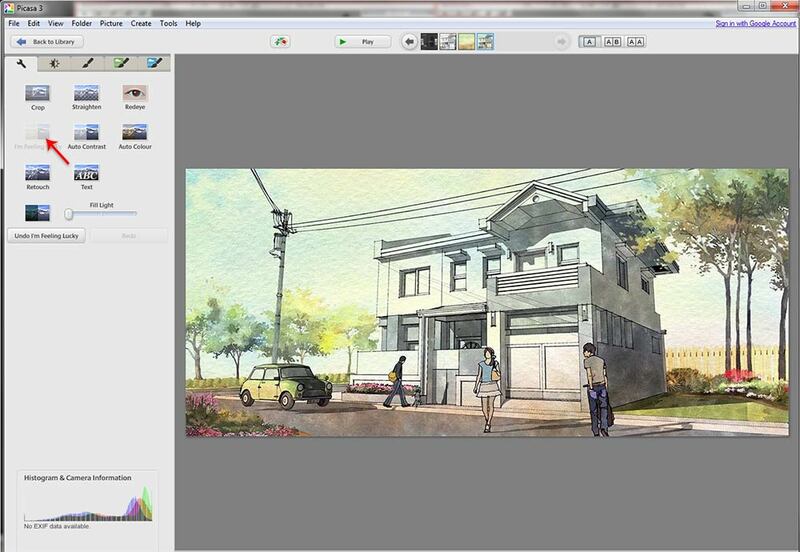 After we have completed Layering all the watercolor entourage in Photoshop, were ready to apply the watercolor effects using filter freeware FotoSketcher. 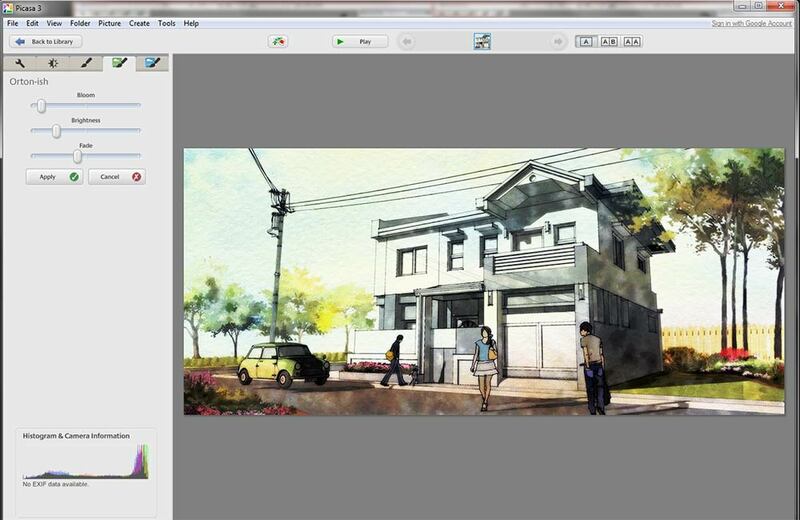 Open your last image in FotoSketcher and select watercolor style ‘Painting 5’. This filtering process created a wonderful character for the image which gave an overall watercolor effect with an informal hand drawn and painted quality. Save image in JPEG format. Here is the result of the saved FotoSketcher image..
14. Going back to the Layering procedure, open the last image from FotoSketcher and a watercolor horizon canvas in Photoshop. Set the Blend Mode to Multiply. 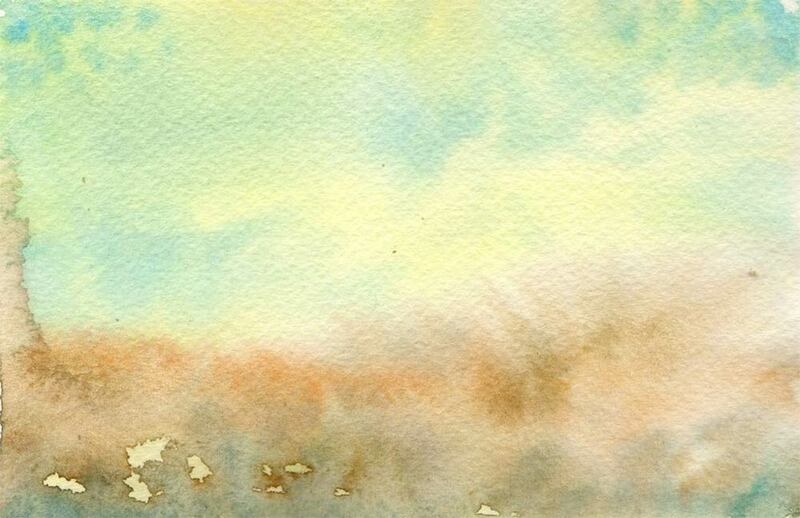 Adjust the Opacity with a 70-80% value. Save image in JPEG format. Here is the result when combined with FotoSketcher image. b. Select – ‘More fun and image processing’ and select Posterise, with sliders set as shown in image below. c. Select- Orton-ish Mode with sliders set as shown in image below. d. Select – ‘I’m Feeling Lucky’ again. e. Adjust the colour temperature as shown in image below (or to what ever you feel looks right) and save in JPEG format. Thank you for taking the time to read this tutorial. I hope you will find it helpful in your future projects and workflow. Do you have the full size plant entourage images available for download?